In Ayurvedic practices, turmeric is thought to have many medicinal properties. Many use it as a readily available antiseptic for cuts, burns and bruises. It is very helpful in diabetes. Raw Turmeric juice is used to treat hyper acidity (acidity of stomach) and indigestion. The juice of raw turmeric also acts as a blood purifier. Curcumin - an active component of turmeric, has antioxidant and anti-inflammatory properties, making it useful for treating arthritis, inflammatory conditions and possibly cancer. 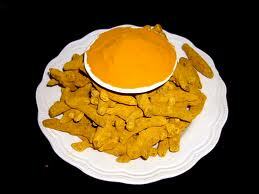 Turmeric is also an inexpensive and indigenous beauty aid. It is used in the formulation of some sun screens. Smearing with turmeric paste cleans skin and beautifies it. Its antiseptic and healing properties prevent and cure pimples.